Three flutes made of bones of red-crowned cranes have been excavated at an ancient tomb in central China's Henan Province, further evidence of remote ancestors playing music long before they could write, archeologists announced on Friday. They believe that the musical instruments, excavated earlier in October from Jiahu, site of a neolithic settlement, although rough and simple, prove that Chinese residents were playing music as far back as 9,000 years ago. The flutes have been dubbed the world's earliest heptatonic musical instruments discovered so far. The narrow brown pipes of around 20 cm in length and 1.1 cm in diameter feature hair-thin patterns carved on their surface. Archeologists have also unearthed a large number of potteries, millstones, handcrafted tools and oracle bones in dozens of ancient tombs and dwelling sites at the Jiahu excavation site. "People who created Jiahu culture were not only hunters, fishermen and craftsmen, but also early farmers and brilliant artists," said Zhang Juzhong, professor at the University of Science and Technology of China who oversaw the excavation work. "Jiahu culture existed at the same time as civilization in Tigris and Euphrates was flourishing and served as a miniature of the development of East Asia at that time," said Zhang. Throughout the 30-year of excavations at Jiahu, archeologists made a number of groundbreaking cultural discoveries. They include what they believe to be the world's earliest alcohol, found by analyzing matter attached to pottery; relic sites where human beings started to raise and train animals; the origins of divination; carved symbols serving as characters; and carbonized rice. The Jiahu site, as a significant relic of the Neolithic Age around 7,500 to 9,000 years ago, has been excavated eight times since 1983. Hundreds of caves, pottery kilns, building remains, tombs and coffins have been found, while more than 5,000 clay pottery, stone and bone antiques had been unearthed. Recent excavations at the early Neolithic site of Jiahu, located in Henan province, China, have yielded six complete bone flutes between 7,000 and 9,000 years old. Fragments of approximately 30 other flutes were also discovered. 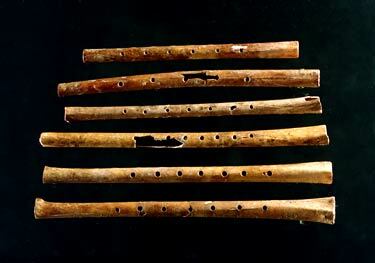 The flutes may be the earliest complete, playable, tightly-dated, multinote musical instruments. Two audio recordings of the flutes being played are available here: WAV file 1 (4.2 Mb), WAV file 2 (1.7 Mb).